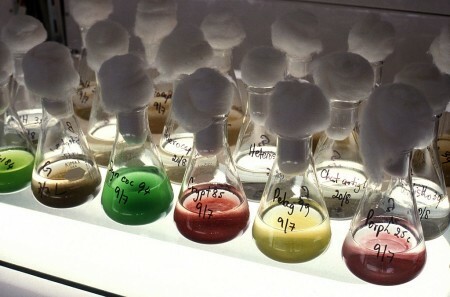 Microalgae cultures in the CSIRO Microalgae Collection laboratory. Large-scale production of algae derived starch could be possible, thanks to new research by the Tokyo Institute of Technology (Tokyo Tech) and Tohoku University, Japan. This algae derived starch is a valuable resource for the production of biofuels and other biomaterials. According to a statement, the team, led by Sousuke Imamura from Tokyo Tech, have found a ‘switch’ affecting the level of starch content in algae. “This information will help to develop technologies to improve starch biosynthesis productivity and concomitantly improve sustainable biomass and bioenergy production," said Imamura, in a statement from Tokyo Tech. Focusing on the unicellular red alga Cyanidoschyzon merolae, the team demonstrated that starch content could be dramatically increased through the inactivation of a protein kinase known to play a key role in cell growth. The protein kinase, target of rapamycin (TOR), was inactivated through exposure to rapamycin. This led to a noticeable increase in starch levels after 12 hours, and a ten-fold increase after 48 hours. Through liquid chromatography-tandem mass spectrometry, the team examined subtle changes in more than 50 proteins that might have played a part in switching on the starch accumulation process. From this, they pinpointed GLG1 as the key protein of interest. According to the Tokyo Tech statement, the results could be hugely important in scaling up biofuel and value-added biochemical production. Imamura and colleagues' study has been published in The Plant Journal.